You will often find, on our site and on others, lawns referred to as being the size of an average tennis court or 'half a tennis court'. This can be confusing as, in our experience, customers are not always sure whether this means the playing area or the whole court from fence to fence including the border. Also championship courts tend to be a little larger than domestic courts. Below (Fig1.) 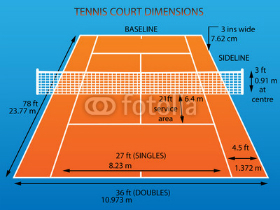 is a picture of a standard court with the lines explained. This is, of course, just the playing area and does not include the area outside. Below (Fig2.) 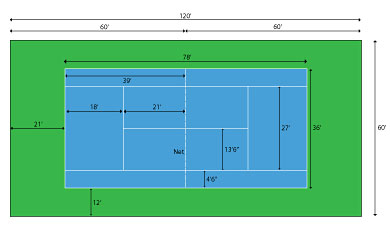 is a court including the outside area or borders (the green area).